Optimal digestion is dependent upon effective digestive enzymes. 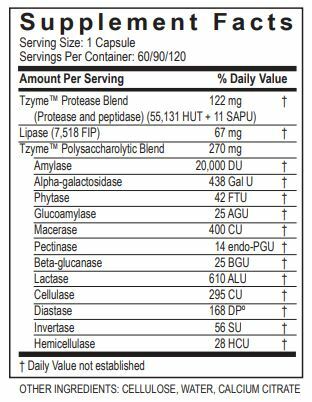 TransFormation Digest include highly active enzymes with a broad range of specificities to handle all food preferences. All TransFormation are carefully prepared to assure maximum quality and nutritional effectiveness. Healthy food choices are a great start to promoting health; however this represents just the first step. To benefit from all the nutritious components of our food, a healthy digestive system is needed. Today, dozens of factors including genetics, stressful lifestyles, poor diet, processed foods, and the environment all influence digestion. Supplementing a healthy diet and lifestyle with digestive enzymes is the next step in health. Our most comprehensive digestive enzyme formula includes highly active enzymes with a broad range of specificities needed to digest the foods most commonly found in the human diet. * Once the food is broken down into simple nutrients, the body can then assimilate these for energy, growth, and repair. support the digestion of proteins for reduced risk of food sensitivities, toxins, and free radicals. encourage more complete digestion of fats and lipids to support pancreas, liver, and gall bladder health and wellness. support the digestion of carbohydrates for reduced food intolerances and relief from occasional indigestion and gas. Take one (1) capsule with every meal or snack with at least 8 oz. of liquid or as directed by health care practitioner. Contents may be removed from capsules and taken by spoon immediately after mixing with a small amount of tepid water. Enzyme activity is measured in Food chemicals Codex (FCC) units. Store tightly sealed in a cool dry place. Keep out of the reach of children. I began having stomach issues last October. Made 2 trips to the Emergency Room because I couldn't quit throwing up. I went to a couple of specialists and went through quite a few "tests" before I was finally put on antibiotics 3x a day, 30 minutes before I ate (for the rest of my life). I became very discouraged. I ended up being put on Digest, Intestinal Support, and Intestinal Cleansing, and feel like I'm living a normal life again! Click the button below to add the Digest to your wish list.